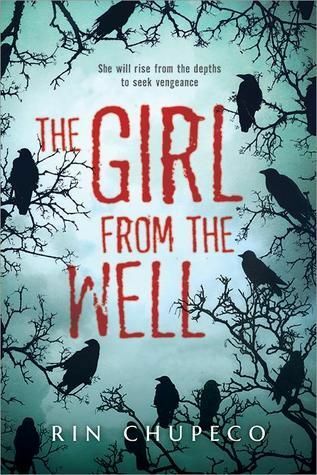 Okay, so this book, “The Girl from the Well,” features such a ghost. She was wronged in death and tossed down a well. And now, she seeks vengeance against those who kill children. Sounds creepy and scary, right? Well, not so much, but perhaps, in this case, that fact does not matter. “The Girl from the Well” is told from the point of view of the ghost, and as the story opens, she is drawn to a young man named Tarquin who bears some unusual tattoos. The boy seems to be cursed, as an evil energy follows him like a dark, angry cloud. The ghost is intriqued, and soon, she meets Callie, Tarquin’s older cousin. Callie has always been close to Tarquin, and continues to try and look out for him. Callie is very aware of Tarquin’s tattoos, and the unusual aura he seems to project. Yet, she doesn’t know the true reason for Tarquin’s trouble until she meets the ghost. And then, facts and dead bodies start to pile up like cordwood. Can Tarquin be saved? Callie and the ghost race to find a way to do just that. This is not a scary book. Rather, it is a gothic tale, one reminescent of a fairy tale or myth. The point of view of the ghost is an interesting one, and the bits of Japanese folklore and history add a nice bit of exotic spice. While the book was not perfect…the point of view voice at times was odd, as it seemed to “float” over the story and reveal it from different characters’ perspectives randomly. The initial change of location to Japan caused the plot to slow down, and I found myself skipping a few pages in order to get back to the ghostly action. However, the story was unique enough for me to finish. This is listed as book 1 of the Girl from the Well series, and while I don’t know if I would be interested in reading the series, the first book was quite enjoyable. This title is a young adult title, but would be appropriate for younger teens who’d like to read a creepier tale.